The Force Axe is 8 lbs and the ideal tool for forcible entry. This axe offers a large strike surface, balanced design and a contoured head to be used as a wedge when necessary. The ultimate tool for forcible entry, perfectly balanced to lay correctly in the hands for that short strike zone on an iron or unlimited padlock breaker. Large, oversized head makes the strike zone more accurate and easy to hit. Cutting edge annealed to keep its edge longer. 6 LB. FLAT HEAD AXE WITH FIBERGLASS HANDLE Features 6 lb. Flat Head 36” fiberglass ..
6 LB. PICK HEAD AXE WITH FIBERGLASS HANDLE Features 6 lb. Pick Head 36” fiberg..
6 LB. 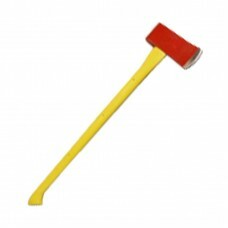 PICK HEAD AXE WITH WOOD HANDLE Features 6 lb. Pick Head 36” Wood handle ..
6 LB. FLAT HEAD AXE WITH WOOD HANDLE Features 6 lb. Flat Head 36” Wood handle ..